I had hoped that by this time in December, I would be sharing new ski touring adventures. 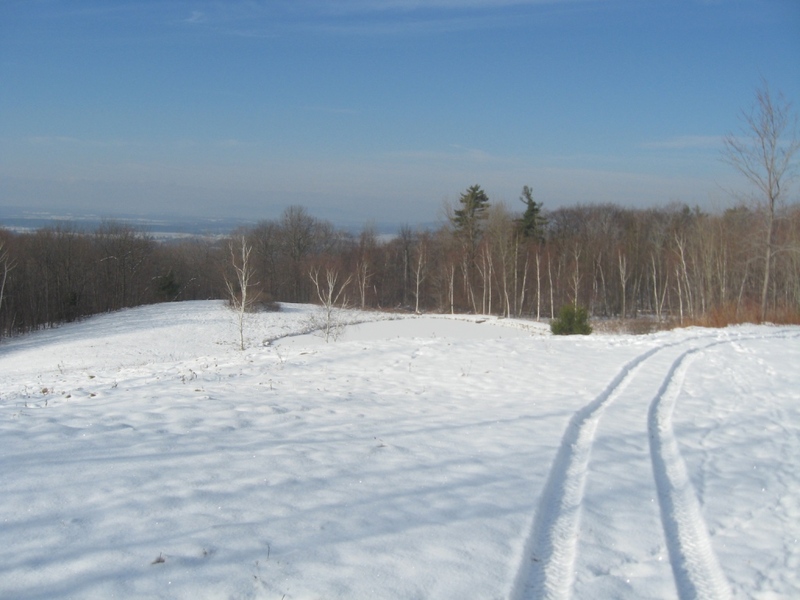 While there is some cross country skiing to be enjoyed, the cover is a little too thin to get out of well-groomed fields and into the more uneven terrain of the woods. That said, I have no objection to trail running in the snow, at least shallow snow, and on this gorgeous sunny day, it seemed a great day for a run on paved road, dirt road, and trail. 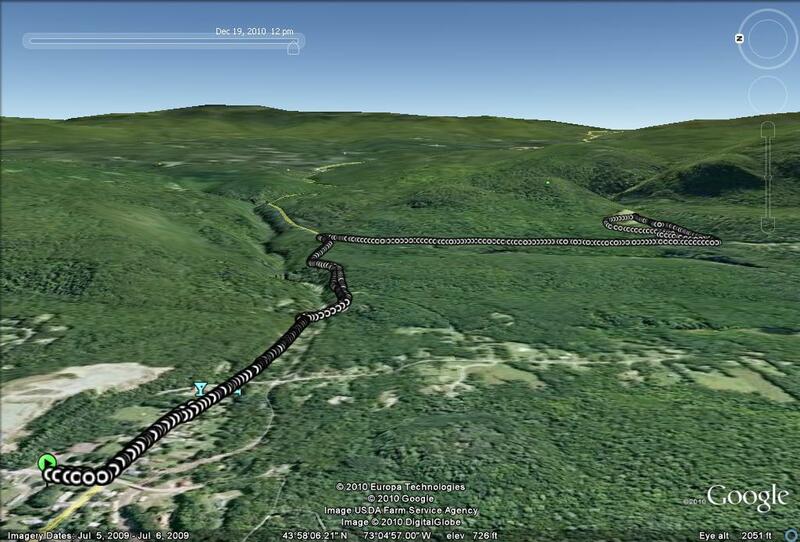 For this run, I am revisiting a segment of a run I first described two summers ago entitled “Secret Meadow” where I described an infrequently visited meadow up on the hillside above Upper Plains Road on the Middlebury/Salisbury border. Today’s run started on the road, however, at the parking lot by the playground on Schoolhouse Hill Road in East Middlebury. Heading east up the Middlebury Gap Rd. past the Waybury Inn brought me to what ended up as the hardest part of the run – the short steep road ascent of Sand Hill. Shortly after topping out this challenge, I took the right turn on Upper Plains Rd., which was not surprisingly snow-covered. Looking through the normally thick woods enveloping the road, I spied a variety of trails which remained largely hidden in the undergrowth during the summer, and made a mental note of their location for future exploration. After a little over a mile on Upper Plains Rd., there is an obvious trail heading to the left on the other side of a forest service gate. A few yards up the trail, the main trail bore left, with a steeper, more narrow trail to the right. 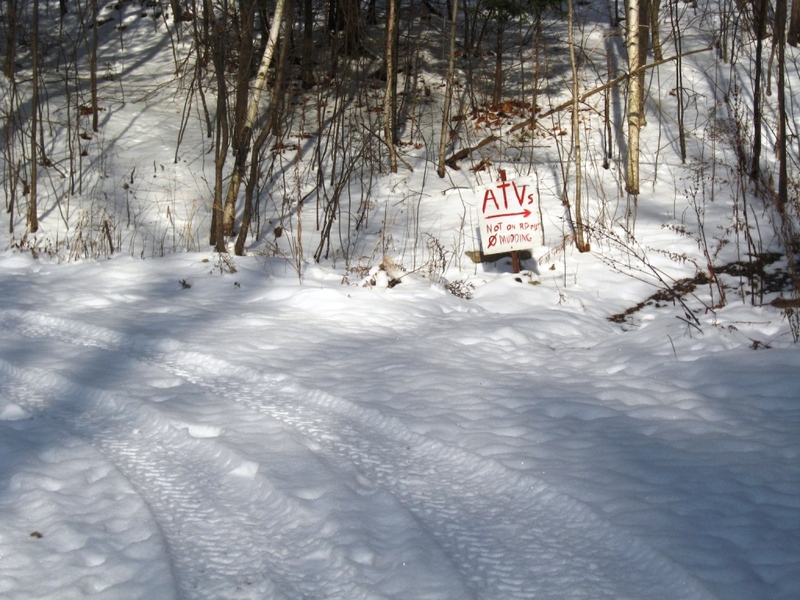 Curiously, there was a sign directing ATV’s to this trail, but guess which way the tire tracks went? Guess which way I went? A short steep ascent brought me to the Secret Meadow itself, which looks quite different in the wintry landscape than it does during summer runs! While it was all blue sky overhead, haze and clouds to the west obscured the often spectacular Adirondack views from this hillside. Turning around, and gazing uphill to the east, I was impressed by rugged appearance the low rounded hills behind me took on when snow covered and devoid of foliage. Returning down the gentler route chosen (apparently inappropriately) by the previous ATV’er, and retracing my steps in descent brought me back to the start, for a slightly less than 5 mile run with a very sane 550 ft of climb and and descent. Have a great Christmas, and hope for more snow! There haven’t been any posts for a few weeks now – hunting season is not the best time for exploring new trails, and the weather has not been particularly accommodating. However, with Christmas coming up, it is a good time to suggest some toys for the runners in your life. One of the allures of running is its simplicity – a decent pair of shoes and gym shorts, and you can have a great time. That said, I have found a few gadgets which certainly enhance my running experience. One would have needed to have spent the last few years in a mayonnaise jar to be unaware of the now ubiquitous iPod, and many runners use this great little device as a training partner. While it is clearly not appropriate to listen to one’s iPod when running with friends (too antisocial) or when running alongside busy roads (too unsafe), they can certainly make the miles go by faster, especially on those runs when the weather isn’t right, the body isn’t right, or you just plain don’t feel like it. Personally, the greatest benefit of the iPod to my running is how it has substantially diminished the frequency of my running injuries. I have a tendency to push solo runs too hard sometimes, but relax and slow down a little when listening to my favorite music or podcasts. Associated with the iPod Nano – the small version of the iPod most suited to running, is perhaps the greatest value in running gadgets ever – the Nike Plus system. This consists of a small receiver attached to the iPod itself, and a tiny transmitter which you put in your shoe. Nike shoes have a pocket for this transmitter built into many of its running shoes, but one can purchase miniscule pouches which tie into your laces if you, like me, don’t find Nikes a good fit. This, with the associated software, gives you your elapsed time and distance (where it is remarkably accurate for so simple a device!) and pace throughout your run. The associated software allows you to see your pace at every point in the run after a routine iPod sync. and even keeps a training log for you. It also has social networking tools for runners, which aren’t my cup of tea, but clearly a source of enthusiasm for a lot of people. This little device is all yours for a mere 29 bucks! The major negative of this device is the unpredictability of its built in battery. I have have had these last as little as a few months, but my current transmitter is over a year and a half old and going strong. Finally, you can purchase narrated workout downloads from iTunes which fit just about all musical tastes and training needs. What could be better than a workout narrated by Lance Armstrong spouting platitudes such as “pain is temporary, but quitting is forever”? The “gold standard” for running gadgets, of course, is the Garmin wrist GPS. If there are other manufacturers of this sort of device, I have not seen them. I use my Garmin for all of the stats in this blog. There are features to this device which I haven’t even tried yet, but in a nutshell, it gives you high accuracy mileage readout, as well as your current pace at any time during your run. After the run, when you sync the watch to the Garmin software on your computer, you can get your altitude at every point in the run, as well as your heart rate if you were wearing the optional heart rate monitor. Readers of this blog will recognize the utility of the altitude readouts. I am not as enamored of the heart rate monitor, however, as it tends to tell me things I usually knew already, like “Guess what – you pushed it too hard today”, as your heart is pounding out of your ears at the conclusion of a long climb. Finally, the software syncs to Google Earth almost effortlessy, allowing me to map my runs on geographical features quite easily. Since it is based on satellite signals, it sometimes loses its signal on trail runs when too much of the sky is blocked by trees. This does not seem to throw off the mileage, or average pace, but does make for annoying spikes in graphs of pace versus time due to the fact that it temporarily assumes the runner isn’t moving when it loses its signal. These GPS’s can get quite pricey (over $300), but if you just want the basic functions and don’t need the heart rate monitor, you can pick them up for the low-mid 100’s if you look around online. Hope Santa is good to everyone!